Caramelized pecans were cooking right there at the theater’s snack bar. You might think that after movie theaters in 45 states you wouldn’t see anything new, but this was a brand new theater snack complete with a delightful smell to compete with the popping corn. Studio City 11 at Mesa in Casper, Wyoming, did, of course, have features we’d encountered at other theaters. They had a discount/rewards program that accumulated points for money spent and discount prices for Tuesdays (we went on Tuesday). 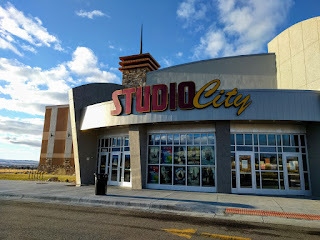 The theater was not part of a national chain, but is apparently a local chain, Wyomovies.com, with Wyoming ownership. The chain had several other theaters in Casper, including two single screen theaters and a discount theater downtown. I’m happy to report that the staff was friendly and helpful. It seems theater staffs go one way or the other. Either they love the cinema and are delighted to share the wonder of the silver screen and buttery goodness, or this is the only job they could manage to find, so they grunt and don’t look anyone in the eye. Fortunately Studio Mesa hires the former type of employee. Studio Mesa also had the posh reclining seats we’ve seen other places (still greatly appreciated). And they were promoting a special upcoming screening of a locally shot ski film, Tight Loose. (Not a uncommon thing here: in August the ski film Way of Life premiered in Casper.) But we’ve been other places where they screened locally produced films. But the pecans, that was new to us. 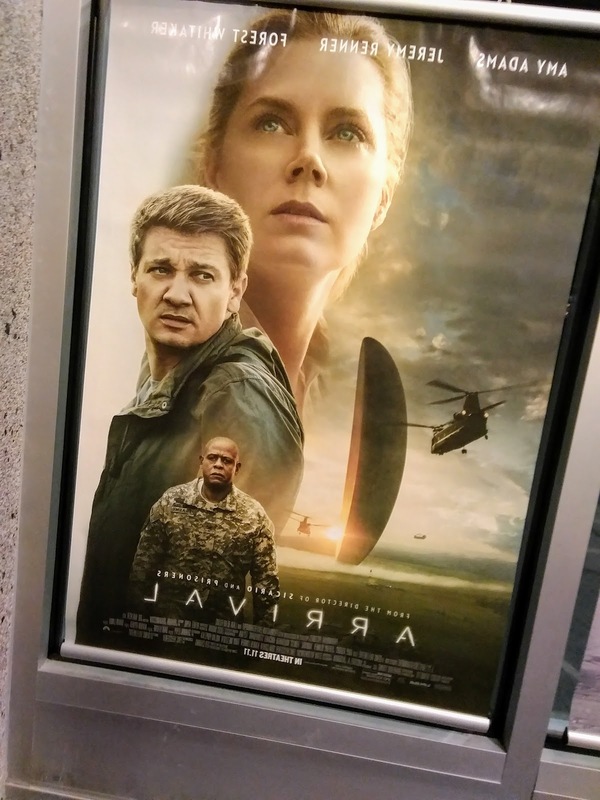 We decided to see the film Arrival because it had an interesting premise involving an alien arrival (title drop) and a Rotten Tomatoes score of 93%. We enjoyed the film -- in a way you could describe it as an elongated episode of The Twilight Zone -- and there’s nothing wrong with that. As we watched the film and discovered that it was set in Montana, there was a minor twinge of regret that we didn’t wait a week to see the film when we were actually in Montana. But we didn’t know about the Montana angle in advance; even if we had, we wouldn’t have known whether it would be playing wherever we went Montana. The National Board of Review just announced their award winners and cited Amy Adams’ performance in Arrival as the best of the year (I’d agree she was very good). 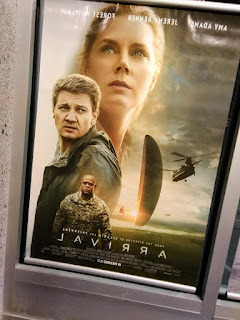 Adams plays a linguist called in to try to communicate with aliens who visit our planet.